Flourish Creative is the Illustration and Design studio of artist Laura Marr. With 20 years in the business, Laura has won national and international awards—most recently winning at the Advertising Club of Richmond’s Print/Design Show in 2018. Laura is the author of Inky Richmond, a coloring book that highlights some of the most beloved sites and landmarks in Richmond, Virginia. The book was inspired by Laura’s love of sketching in her travel journal, and a wish to share the beauty of her hometown with others. 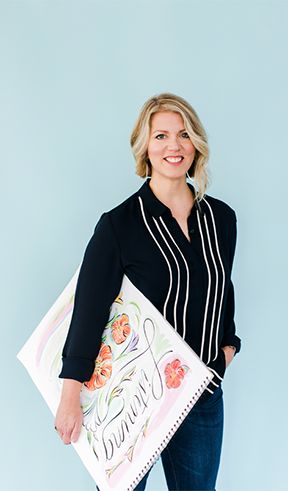 She has illustrated for magazines, children’s books, greeting card companies, and for clients such as McGraw-Hill, The Virginia Museum of Fine Arts, The Corcoran Gallery of Art, many magazines, and more. Laura has been an invited guest speaker to the Art Institutes of America Design Faculty. She holds a BFA in Graphic Design & Illustration from Baylor University, with additional study at the Santa Reparata School of Art in Florence, Italy. As a graphic design consultant, Laura has worked with a wide variety of clients, including The Smithsonian Institute, The Science Museum of Virginia, The American Civil War Museum, Richmond Ballet, The Virginia Association of Museums, Baskerville Architects, and more. Laura is also a fine artist.